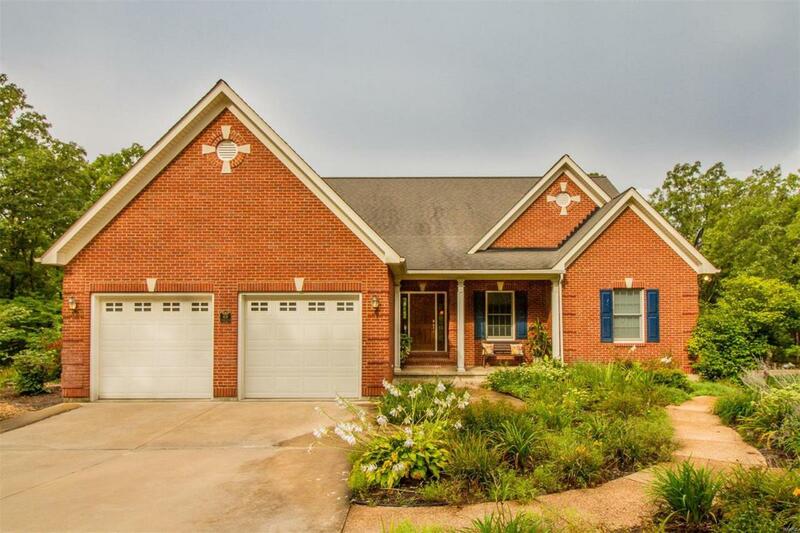 Stunning, all brick ranch home on 15 wooded acres with beautiful woodwork and many details. Custom cabinetry, fireplace, and bookshelves, granite countertops, wood floors, high ceilings and many windows to take in the view and wildlife. A spacious sunroom off the kitchen / dining area adds plenty of light, the finished lower level offers room for entertaining (complete with wet bar and 2nd fireplace, walk out patio) and additional sleeping quarters, the safe room provides extra storage and workshop area. Oversized master suite features a coffered ceiling, walk-in closet, shower, large jacuzzi tub, and so many stunning details. This property also includes a 24x24 detached garage / workshop with overhang, irrigation system, and stunning landscaping. Tour this property for an impressive list of features.